When you go to a place on this earth and the weather is cold and squally and yet you still feel you have been to paradise......................then that is paradise surely? Our real prize was this. Johanna Beach. Our view.... actually our beach as it turned out! What the "/$%^K" are they Momma? What the "$%? *&" are you, 4 legged furry thingamimbob? Papa, Mama and little bob! Here come the heavy mob! 7ft tall, the fence has no purpose whatsoever! They keep the sheep contained but not the "boys"
At a time of personal sadness, this is an image I will carry forever as a joyful time in my life. Thank you for the health and circumstance, for the opportunity that I have to be here in this moment, on this day, to take this photo and to appreciate ALL that it is and symbolises. Two lovely, fresh, plump Snapper called for a bit of inspiration from Hugh Fearnley-Whittingstall and his River Cottage. I was so delighted with my bargain purchase from my "best kept secret source in Bentleigh", (shhh! ), I forgot to ask the fishmonger to gut and de-scale. Hate that! Can only be done wearing surgical gloves. It goes like this. 6 easy steps. 1. Crush one whole star anise in a pestle & mortar. 2. Combine with grated ginger, garlic, chopped red chili and a small onion. 3. Add enough soy sauce to make a thick paste. 4. Make 3 slashes through the flesh of the fish. Works well with bass and bream too. 5. Wearing surgical gloves once more, work the paste into the flesh and cavity and set aside on a lightly oiled baking tray. Serve with steamed Asian greens, (Bok Choy/Chinese Cabbage etc) in a delicious dressing and boiled rice. Combine all of these ingredients and keep tasting and tweaking till its perfect for you. Use as a marinade for all meat, fish & seafood. As a salad dressing or a stir-fry sauce. Or just throw it liberally over steamed vegetables like this. Just delicious! 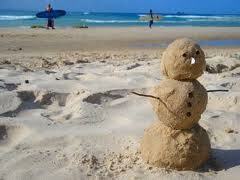 December 25th, Christmas Day, is pretty much slap bang in the middle of the Aussie Summer. The high temperatures see families focus on salads and BBQ's because it is just too hot to get enthusiastic by roast turkey and all the trimmings, especially the prep and cooking of it. However, the canny Aussies enjoy a traditional Christmas dinner just like the rest of us! 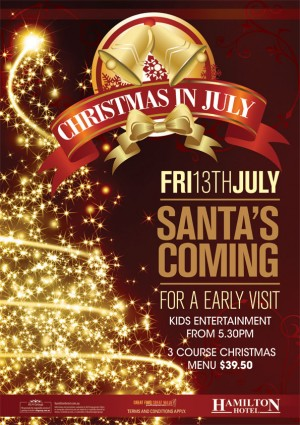 So many Aussie's have opted to do Christmas dinner in July instead, which is in the middle of their winter. Today we decided to do Christmas in July, but guess what? The weather turned out to be so warm that it really didn't feel right to go the whole hog (or turkey) either, not even in "Winter"! So we did a bit of a half way house! Hubster was delighted with his sewing kit in his Christmas Cracker, can't you tell? The jokes were equally as awful, "What lies in a pram and wobbles?" Some will think this a very strange letter to write to your Mum but if I am doing this blog, I have to be true to myself and relay things how they are...................it's not been the easiest thing to do. I wish it could have been a very different one. You know the kind, I could have written one of those I suppose but it wouldn't have been honest and well what's the point in that? Today I write these words with tremendous sadness. Sadness not for the person you were but for the person you were not, but could have been, had every opportunity to be. Sadness because you left this life, without ever having really "lived", tragically we know this because you said so. Sadness because you just never found any lasting inner peace, joy or contentment in your life. Time and time again you chose a lonely path and a joyless one. Even when you had so many chances to take another route, you never would or more appropriately never could. It was heartbreaking for us to see you this way. Your children, grandchildren and family tried many times over the years to drag you off that troubled path, but no matter what, you seemed compelled to follow it. When Dad left, it was like any light you had was instantly extinguished, never to be reignited. You lived out the rest of your life in the shadows after that. You fell into a deep well of despair and you decided that was where you were going to stay. You were passed a rope on many an occasion but you just refused to climb out. Boy it was frustrating! Nothing could bring you to the surface, so I can only imagine your despair must have been bottomless and that is so very sad. How we would have loved to have seen you laugh and smile so much more than you ever did. Because when you did you ignited hope in all of us - "maybe this time will be different" we would say and our hearts dared to hope once more. Sadly, those times didn't last long enough and any joviality was quickly suppressed by the darkness you clung to within. Sometimes you pushed us away so hard that we had to walk away, regroup and find the strength to come back to you again. But we always came back Mum, as best as we could, because you were our Mum, regardless. Sadly we all ran out of time even though we never ran out of hope. We did our best for you Mum, that I can say, hand on heart from us all, even though you didn't make it easy. I know that may sound a bit flippant Mum but what I really mean is next time round, please make sure you truly LIVE because you have a lot of catching up to do and it's all we could ever want for you. Till then, good night sleep tight Mum. You only get one Mum, so we will miss and love you all the same, always. People write blogs for all manner of reasons. There are cookery ones, gardening ones, trainspotting and lots by ex-pat women like me too. In fact whatever the topic, there is sure to be a blog about it. I don't have a "genre" Mrs T-J is pretty much about my life and that is about it. Now that could be considered extremely self indulgent, why should anyone care about what I do anyway, so why do I put it out there? Generating a large audience of readers was never the "raison d'etre" or one of my goals for my blog at all, still isn't. 1. A creative outlet for my writing, which is something I love to do. I love written muses, quotations and poetry too. 2. An online diary with pictures of my life, so that in years to come I can reflect and remember with clarity and nostalgia. However, as time has passed, it has been wonderful to get feedback that people do enjoy it or at least find some of it interesting and for me that's some kind of validation, it feels nice. Then something quite amazing happened yesterday. I received a parcel from home, from someone I have never seen or met, but who happens to know someone I know. Unbeknown to me this lady has been following my blog and her letter was most supportive and littered with references from many past entries. It was strange, I felt that this person knew me. She also sent me souvenir copies of all the Diamond Jubilee Newspapers too - very lovely. But most of all she sent me a beautiful gift of thoughtfulness and the generosity of human spirit. She simply didn't need or have to do this, a selfless gesture, knowing that it would make my day. It did. Thank you Ms E.S from Scraptoft. Your letter will be treasured and your kindness always appreciated. P.S. ....and in return give Poppy a cuddle from Radders and me from the other side of the world. 14th July, Bastille Day, a huge celebration for La France. However, L'esprit de la Revolution came to Melbourne too. 20 years ago, Port Philip had a very large French community. Port Philip is also home to the fabulous South Melbourne Market, my new discovery. 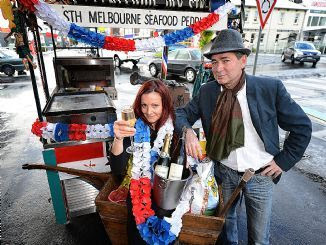 The French owner of the seafood eatery, Renan Goksin, has decided to bring the festivities back. Renan, is quite a character and definitely a local celebrity. As we are complete seafood whores these days, we headed on down there for a pescetarian feast and a bit of Edith Piaf on the accordion. A fabulous way to spend a Saturday afternoon. We think it's wonderful that you can shop for your fruit and veggies and in the same space go and enjoy food of such high quallity as this! Sharing little plates of delectables, tapas style is one of our most favourite ways to eat. We call them our "linky lonky lunches", a bit of this and a bit of that, a "nice tasty nibble", says the Hubster and always with a wink! Claypots Evening Star you are not just an evening star but a bloody good lunch time one too. Time for a bit of Alfie Boe and Les Mis now I reckon. A kick up the bum! "Life is like a coin, you can choose to spend it any way you like, but you only get to spend it once"
It's just what I needed. Even if the terse delivery of "that's pathetic" made me blush and hide behind my hair. Liz, one of Hubster's colleagues from the UK came over. The three of us went out for dinner. Five minutes in and the tour de force of "Liz" was evident. A young girl growing up in the 60's and a pretty hedonistic time of it in the 70's, 80's and beyond. I don't know for sure but I gathered it to be the case. She directed her steely gaze at me. "So what exactly have you seen and done in Melbourne, what are you doing to fill your days?" Well you lot know that it mainly consists of dog beach, food shopping, the odd coffee and being a house sheila - so far. You know that feeling when you shrink and become smaller and smaller and in my case a little squeakier of voice. Boom. Liz delivered her verdict. So from now on I do something new every week. Even if it was a trip to the pictures, seeking out a new market. I have a willing recruit to my cause and ally in my lovely friend Anthea so we are stepping out together. Liz you wanted me to do Art Gallery's. This is "Coffee Shop Art". Just choose your pod and good to go! Happy 2nd Birthday little man. You are the first dog we have ever had from a puppy. When you came to us, we didn't realise how very poorly you were and we nearly lost you. After just 2 weeks with us, you had truly stolen our hearts and the prospect of losing you was unbearable. You wanted to be with us just as much as we needed and wanted you to be, we all fought together and against the odds you pulled through. An unbreakable bond was made. We have seen you grow into your long legs, your big wonky ears and your clumsy puppy paws. We have known what it's like to need a drawer full of spare shoe laces. We soon learnt that books, phones and remote controls if carelessly left lying around, made excellent puppy toys although the Christian Louboutins were unforgivable! We shared your wide eyed joy at your first snow and the sand under your feet on your debut trip to the seaside. We also bore your anxiety and more when you had to go into quarantine and delight once again when we could bring you home. Little do you know but our world revolves around yours pretty much and hope it does for many, many years to come. You make us smile every day, we just simply couldn't love you more, you being you makes a very happy US. Together we are family, together we are the T-J's. 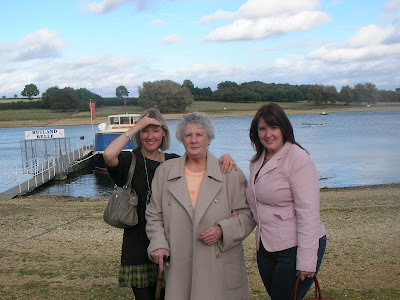 P.S Happy Birthday today too to my lovely Mum-in-Law, a little older than Radders but just as young at heart. Fish and Chips taste even better when you eat them at the seaside, don't you think? A glorious Winter's day, a slight nip in the air, bright sunshine and clear, deep blue skies and a 20 km bike ride for the best fish n chips, Bayside. We cycled up to Half Moon Bay at Black Rock to take a look at the ship wreck of HMS Cerberus. She was deliberately sunk in 1923 after 53 years in service. She acts as a breakwater in Half Moon Bay. It was a popular scuba diving site for many years until a severe storm in 1993 broke up the ship and it was declared too dangerous. The Cerberus Beach House Restaurant commands wonderful bay views from it's first floor vantage. Below is a fabulous fish and chip shop. All cooked fresh to order, you do have to wait a while but it is definitely worth it. We will certainly be back to try the restaurant minus our unflattering cycling helmets! We would highly recommend, the Barramundi in the lightest of batter. So moist and fresh. We heartily tucked in as the Winter sun massaged our backs with warm, soothing rays and drank in the views. Just stunning. Most products that I’ve purchased, particularly food, are locally produced or made. Buying Australian whether it be food or goods is a big thing here, even if you pay a bit extra. The Aussies have totally bought into the "Buy Aussie" philosophy. Yes there are huge shopping centres and big supermarkets too but if you lament the loss of a great butchers and a friendly fishmonger on the British High St, then Melbourne doesn't disappoint. Melbourne has some fantastic markets; South Melbourne, Prahran and The Queen Victorian to name a few. Browsing stall after stall oozing with fresh fruits, vegetables, cheeses, dried goods, spices etc is a passion of mine. They also have lots of cafes and all sorts of entertainment too like cookery schools and food festivals. I never understood my Dad's fixation with DIY/Hardware stores. He would browse through rows and rows of nuts, bolts and screws much to my disdain. "A screw is not just a screw, there are round heads, flat heads, all different sizes, lengths and they all do different jobs" he would explain. Dad I get it now, I could apply your logic to a Chili just the same! I love walking to my local High St and going to a real butcher or fishmonger for fresh meats and fish. Often they ask me what I am cooking and I enjoy sharing recipes and cooking methods with them and there is always a bit of banter, of course! The fruit and vegetables here are not only abundant in variety and at peak freshness but taste absolutely delicious. I had forgotten that a tomato and an apple don't taste of water after all. I love the diversity of food too. I can buy orange, red and white sweet potatoes, passionfruits, pomegranates, persimmons, paw paw, mangoes and avocados straight from paradise. The lemon grass, galanghal, ginger and garlic not to mention the chillies are so fresh and pungent, less is definitely more! The diversity of food in Melbourne is also wonderful. Whatever your taste, there is a restaurant for you - not far away. There's Italian, Thai, Chinese, Vietnamese, Indian, Japanese, French, African, Portuguese even Croatian (comes up for air) and of course delectable Seafood too. We are just a bit spoilt and the added lbs are testament to that!